All our Residence Halls close at 8:00 am on May 19, 2018. Sunvilla and Monroe Apartments remain open. President’s Breakfast is a campus tradition at Missouri State University, sponsored by Residence Life, Housing and Dining Services. Join us for a late night study break, music, prizes and a hot breakfast served by President Smart and University administrators. Door prizes will include: Boomer Meals, Bookstore gift cards, iTunes gift cards and one lucky student will receive Beats by Dre headphones. Prizes sponsored by Residence Life, Housing and Dining Services with thanks to our partners at the Missouri State Bookstore. You must have your BearPass ID to enter. Today is the last day to change sections, drop, or withdraw from Spring 2017 Full Semester classes with a 50% refund. Change of sections, drops, and withdrawals can be processed online at My Missouri State. If you have a hold on your account, please visit the Holds page on My Missouri State to drop class(s). Office hours are 8:00 am – 5:00 pm. The Student Exhibition Center invites students, faculty and community members to the upcoming Metals, Jewelry and Photography Students’ Biennial Exhibition. The exhibition consists of a combination of two-dimensional and three-dimensional work produced by current Art+Design majors. 10:00 AM – 1:00 PM, February 08, 2017The Community Engagement Fair is co-sponsored by the Center for Community Engagement, Public Affairs Support and the Career Center. This event invites community agencies to come on campus and exchange information with Missouri State students, faculty and staff. The goal of the Community Engagement Fair is to foster a relationship between the Missouri State community and local organizations. Student Volunteers – Are you looking to enrich your college experience through community service or internship? Are you passionate about a particular social issue? Come by the Community Involvement Fair and learn about organizations making a difference in our city, state, nation and the world! This year, our Spring Community Engagement Fair will be on Feb. 8 in the Plaster Student Union. The event will run from 10 a.m.-1 p.m. Check-in for agencies will begin at 9 a.m. If agencies have questions, please contact the Center for Community Engagement at 417-836-5774. The film chronicles a summer afternoon day in 1989 when the future President of the United States, Barack Obama, wooed his future First Lady, Michelle Obama, on a first date across Chicago’s Southside. This session explores the identity development and experiences of identifying with more than one racial and ethnic heritage. The election of Donald Trump and many other social factors indicate this will be an intersting year in terms of the continued effort to understand race in our nation. This Lunch & Learn will explore marginalized identities within the #BlackLivesMatter Movement. The Lunch & Learn workshop series is a new program for Multicultural Programs and debuted during the 2016 Fall Semester. These facilitated discussions explore diverse issues, hot topics and current events. Discussions are led by staff members in Multicultural Programs or invited guests such as students, student organizations, staff and faculty or community members. The premiere of a new documentary “Remembering the Normal Heart Controversy in Springfield, Missouri,” sponsored by the Department of Media, Journalism and Film at MSU, will be on Saturday, February 11 at 7:00 PM at the Plaster Union Theater. In the fall of 1989, The Southwest Missouri State University (now MSU) Theatre Department decided to produce The Normal Heart, and autobiographical play by Larry Kramer about the politics and early stages of the AIDS epidemic in New York City. The Department wanted to bring AIDS education and awareness to students and the local community. When a local conservative state legislator read the play and was offended by its content, she organized a large coalition of like-minded individuals calling itself “Citizens Demanding Standards.” Their goal was to stop production of the play or to censor its content. The University stood firm in its position that stopping the play would violate the Constitutional Rights of students and faculty. The controversy escalated to the national stage as the battle over public funding, morality and free speech culminated in an opening night act of violence that left the community stunned. Through personal stories and archival news footage this film explores the controversy surrounding the 1989 production and is a sobering reminder that extreme views can incite extreme actions. In 1989, the Southwest Missouri State University Theatre Dept. staged a production of The Normal Heart, an autobiographical play by Larry Kramer about the politics and early stages of the AIDS epidemic in New York City. The goal of the production was to bring AIDS education and awareness to students and the Springfield community. A state legislator formed a coalition called “Citizens Demanding Standards” with the goal of stopping the production or censoring its content. The University stood firm in its position this would violate the Constitutional rights of its students and faculty. The controversy escalated to the national stage as the battle over public funding, morality and free speech culminated in an opening night act of violence that left the community stunned. Through personal stories and archival news footage, the film explores the controversy surrounding the production and is a sobering reminder that extreme views can incite extreme actions. After the screening, executive producer & MSU alum Patricia Moore and creative director Dax Bedell will discuss the making of the film. SPRINGFIELD — The ceremony to unveil a statue of assistant women’s basketball coach and NCAA Division I all-time leading scorer Jackie Stiles will take place on Feb. 12 outside JQH Arena. The public is invited to gather on the southeast side of Missouri State’s basketball arena at 1:15 p.m., between the main entrance and the Jim D. Morris Basketball Complex, in preparation for the bronze likeness to be revealed for the first time. The unveiling begins a full day of basketball activities at The Q, as the MSU men will host UNI at 3 p.m. before the Lady Bears take on Evansville at 7 p.m. Both games will feature $1 hot dogs and $1 bottled Coca Cola products at the concession stands, while the women’s game will have $1 lower bowl tickets available in select sections. Separate tickets are required for each game as the arena will be cleared between contests. Game day parking protocol will be in effect all day. Fans are encouraged to order their $1 Lady Bears tickets by phone at 417-836-7678 or in person at the Old Missouri Bank ticket windows inside JQH Arena, either the day of the game or weekdays from 10 a.m.-5 p.m. Featuring Dr. Tanya Whipple discussing healthy relationships! How does our educational system prepae and identify prisoners? Is there a relationship? Learn, talk and act! Students from the CHI 312 and CHI 102 courses will represent the Modern and Classical Languages Department and Foreign Language Institute with a showcase of Chinese language skills in song. Chinese New Year events are co-sponsored by the Department of Modern and Classical Languages and China Programs. 11:00 AM – 12:30 PM, February 15, 2017Join Transfer Student Programs and Real L.I.F.E. for the Transfer Lunch Hour. Bring a lunch and learn about financial aid and literacy on our campus. Free giveaways for transfer students! The SAHE Assessment Symposium is dedicated to showcasing the assessment work completed by the students in the Student Affairs in Higher Education (SAHE) master’s program at Missouri State University. The Assessment Symposium provides a learning opportunity for staff, faculty, and students at Missouri State University as well as neighboring institutions in the Springfield area. Come support our students and learn about various program assessments that have taken place on Missouri State University’s campus. Presented by students of LLT 215, Asian Cultural Studies, Department of Modern and Classical Languages. Students will present information on the important cultural significance of the lunar new year in China. This holiday is celebrated across Asia – see what it’s all about. Interested in studying abroad but you’re just not sure where to begin? Come to a Nuts and Bolts of Studying Away session to get preliminary information about studying abroad, various Study Away options and the application process. These sessions are fun and informal, so just drop by and ask your questions. We hope to see you there! In 1996 Missouri State University hosted the first ever Student Talent and Recognition (STAR) Awards Ceremony. Each year the STAR Awards ceremony honors roughly twenty-five outstanding student leaders and student organizations which have been nominated by various organizations, students, faculty, and staff. 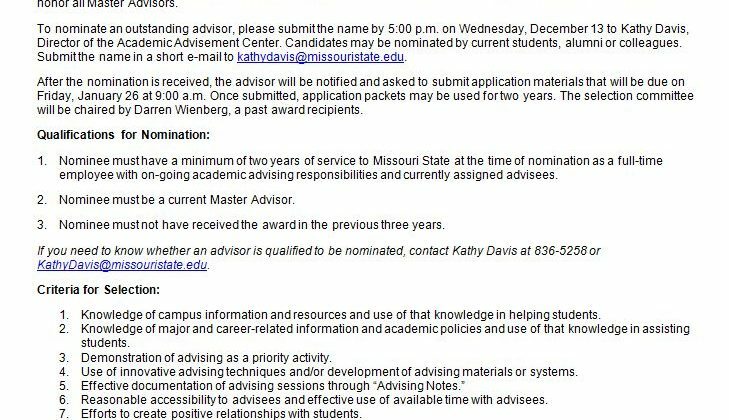 Since its beginning, STAR Awards has recognized roughly 350 students, organizations, and advisors at Missouri State. This occasion is best described as a business formal/cocktail event which provides a buffet dinner and surrounds its guests with elegant décor. On average, 150 applications are submitted to the Office of Student Engagement each year and nominations are taken from faculty, staff, students, and student organizations. We encourage you to make nominations for every award possible, for there are two categories: organization and individual. All nominations may be completed utilizing the CampusLINK form. *No applications will be accepted via email or physically. Only those submitted utilizing the online nomination form will be accepted. Click here for a description of each award category. To nominate an indivudal or an organization, click on the title of the award below in the table. Nominations will be accepted beginning Monday, January 23rd through Friday, February 24th at 5pm. Self-Nominations are not accepted for the Individual Category. Organizations should include documentation if asked. No penalty will be given, however organizations that provide sufficient material are more likely to be considered for the award. Some nominations require letters of recommendation. Those letters need to be submitted via the online nomination as a pdf. Email Andrea Greer, Assistant Director of Student Engagement for Co-Curricular Involvement, at AGreer@missouristate.edu. Résumé Madness is held each semester at various locations around campus. Bring a printout of your résumé to receive a quick review and tips. This service is free to all Missouri State students and alumni. Led by the Center for Dispute Resolution, all students are welcome to come learn how to manage conflict amongst your peers as a leader. Student Affairs in collaboration with Multicultural Programs, Office of Student Engagement and SOFAC have created a new fund for students to implement diversity programming on campus. Students and Student Organizations interested in applying for funding must attend an information session. Come join peaceful HATHA Yoga by Kirsten Houston. Saturday, Mix It Up is now in Studio A, instead of C.
Has the first week of school already taken a toll on you? Take 30 minutes or 1 hour and stop by the recreation for Massage Therapy! Check out our prices on our website and set up an appointment today. This is a free course offered to both males and females. This class is meant to prepare you with the mental and physical skills you will need to help protect yourself when put into unexpected situations. Sign up for the 2/27 and 2/28 session today at http://www.missouristate.edu/recreation/Wellness/SHARP.htm. Reserve your spot by 2/26 to join! Love playing video games? This is your chance to show everyone what you’re made of. 6 person teams will compete in an online tournament from the comfort of your own home – computer exclusive. The grand finale of the competition will be held in the Rec! Need equipment for your Spring Break trip? Check out all of the equipment rentals Outdoor Adventures has to offer! Rentals start at $1 a day! Register for CPR/First Aid Instructor classes by January 22nd! Class is held January 27th from 8:30 am – 5:30 pm. Register for Lifeguard Instructor classes by January 27th! Come learn how to paddle board at the Foster Recreation Center! – Sunrise Flex and Flow on Thursdays at 8:15 am from February 2nd to March 9th. – Sunset Flex and Flow on Thursdays at 7:00 pm from February 2nd to March 9th. Combine any Paddle Board Class to create a package! Intramural Badminton Tournament registration deadline is February 8, 2016. Cost: $5 Register at imleagues.com or contact Lauren Easter at leaster@missouristate.edu. Actual Game day is Sunday, Feb 12. Time TBA. Bring a friend free to any BearFit class of your choice! Share your love of BearFit classes with the one you love! Includes Monday 2/13 and Tuesday 2/14 only. 1 friend; 1 class; 2 days! You can bring 1 friend to 1 class on one or both days – it can be the same or different friend each day. Private swimming lessons are available for students, employees, and children of members. These lessons can be purchased in blocks of 2 or 5 lessons. All lessons are scheduled at the Welcome Center at the time of registration based on facility, instructor, and participant availability. Your swim instructor will tailor the class to meet your specific needs. Two levels of group swimming lessons are offered: beginner and intermediate. The beginner course will focus on the basic fundamentals of swimming, including submersion, the back float, treading water, and simple swimming strokes. The intermediate class will build upon the skills learned in the beginner course, working on rotary breathing and lap swimming techniques. Course Frequency/Length: Classes meet once per week for 45 minutes for 6 weeks. It’s February so WellFit has started! It is a month of activities with incentives to get you going. Live well, live fit, with Campus Recreation. Visit the FRC Welcome Desk for more information how to get started. Admission: $5 one time fee! With the $5 activation, you receive a free drawstring bag, coozie, and frisbee. Session 1 is on Mondays from 1/30-3/6 and Session 2 is on Thursdays 2/1-3/8. Test your core, balance, and strength with this challenging yet fun workout! Start 2017 off with the right mindset and join the first session Thursdays from 2/2 – 3/9. Therapeutic Yoga is a combination of therapeutic, yin, and restorative yoga, all of which are aiming at helping your body and mind relax. This practice will help one feel serene, centered, and balanced. This is for the ones who want to calm their mind while still working their stamina, stability, and core strength. For morning people Sunrise Flex and Flow is held everyThursday at 8:15 AM, but for others there is Sunset Flex and Flow on Wednesdays at 5:00 PM. Both Monday and Wednesday sessions go from 2/2-3/9. Join us today! Last day to Drop or Withdraw (student will receive an automatic W grade), declare Pass/Not-Pass, and Change to or from Audit for Fall 2016 Second Block Classes. Pass/Not Pass and Audit changes must be processed through the Office of the Registrar, Carrington Hall-Rm. 320. Check the MSU Master Calendar for campus events celebrating Native American Heritage Month. Panama prepares every November a festivity due to all Independence events around the formation of the new free Panama. All panamanian have parades with local school marching bands, teachers, honor rolls students marching in the main streets of cities. 12:15 PM – 1:15 PM, November 17, 2016The #SayHerName Movement is a response to the stories of Black women who are making public their demands for justice, policy responses and media representations of police brutality. This Tough Talk will introduce you to women and girls of color and share their stories, leading to the creation of a space to discuss the intersections of race, gender and state violence. The 2016-2017 Seniors will meet at the Tower Club at 6:30 for their annual Etiquette Banquet. Brian Regan is one of the most respected comedians in the country, earning praise from the press, the public, and fellow comedians. On September 26, 2015, he made history with the Comedy Central broadcast of Brian Regan: Live from Radio City Music Hall – the first ever live broadcast of a stand-up special in Comedy Central’s history. His performance was critically acclaimed, with Vanity Fair calling Regan “the funniest stand-up alive.” The special is now available on CD, DVD, or as an audio or video download. Currently a regular on The Tonight Show starring Jimmy Fallon, Regan made 28 appearances on the Late Show with David Letterman, the most of any comic in the show’s 22 years on CBS. Regan made a scene-stealing cameo in Christ Rock’s film Top Five, and he was seen in Seinfeid’s Comedians in Cars Getting Coffee. But it is stand-up comedy that is Brian’s focus, as he visits close to 100 cities each year, selling out some of the most beautiful venues on the continent. Location: Hammons Hall for the Performing Arts, Juanita K.
Location Plaster Student Union, Robert W.
We will be bringing in a casino company that will set up various games that you would often play such as black jack, slot machines, craps, etc. There will be prizes given out throughout the night. According to DKMS.org, every three minutes, an American is diagnosed with a blood cancer. Please stop by Foster Recreation Center from Nov. 15-17 to learn more about bone marrow donations and how you can swab and save a life! This 24-hour GMAT preparation course will be held for 1.5 hours twice a week for eight weeks. It will be held every Tuesday and Thursday evenings from Oct. 4-Dec. 1 (no classes on Nov. 22 and 24). The cost is $399. Required Book: Cracking the GMAT, 2016 Edition (ISBN-13:978-0804126021 or 978-0804126014) The versions with two and six computer practice tests are both acceptable. Buy an Unlimited Pass for only $35 and take every class you want for the entire semester! Movement series synchronized with the breath giving both physical and mental benefits. Seeking hats, gloves, scarfs, etc. The day of September 15 is significant because it is the anniversary of independence for Latin American countries Costa Rica, El Salvador, Guatemala, Honduras and Nicaragua. In addition, Mexico and Chile celebrate their independence days on September 16 and September18, respectively. Also, Columbus Day or Día de la Raza, which is October 12, falls within this 30 day period. Check the MSU Master Calendar for campus events celebrating Hispanic Heritage Month. To all graduating seniors note that there has been a time change for the fall 2016 commencement, please check out the link above for more information. Missouri State University invite you all to the 2nd Annual CARNAVAL Banquet and Cultural Show “FACES of Latin America”. Join the Latino students on campus and the Latino community in Springfield for an evening of fun and entertainment showcasing the diverse and colorful cultures of the Latin American countries. CARNAVAL 2016 will happen among other Missouri State University events to commemorate the Latinx Heritage Month. The evening will begin at 6:00 p.m. with a banquet of authentic Latin American foods prepared by students of Missouri State University and the Latino community in Springfield. It will feature both vegetarian and non-vegetarian dishes. The banquet will be followed at 8:00 p.m. by traditional cultural entertainment. The show will include dance routines, musical offerings, skits and other types of performances that highlight the diversity of Latin American cultures. Tickets (dinner and show included) are $10 and will be available for purchase starting on September 19th from 10 a.m. to 5 p.m. at the PSU tables located by the Convenience Store on the second floor or call Juliana Alvarez at 417-818-8471. October 4th, 6:30-8:30PM at the Foster Recreation Center in Studio B. Join us for a free celebration! Campus Recreation’s Bearfit and the Multicultural Programs are collaborating to celebrate Latinx Heritage Month with a workshop to help learn Latin dances and culture. From 12:00 PM – 1:30 PM on October 09, 2016 in Downtown Springfield. Each participating student organization will be partnered with a downtown Springfield establishment. Organizations will decorate a business window reflecting the spirit and pride for Missouri State Homecoming! From 2:00 PM – 5:30 PM on October 09, 2016 at the PSU. Join us on campus as we kick off Homecoming Week with the Window Painting and Chalk-N-Rock Competitions, starting off at Trottier Plaza and ending at Plaster Student Union. Participating student organizations will paint and chalk designs reflecting the spirit and pride of Missouri State University! From 1:00 PM – 3:00 PM on October 10, 2016 at the Trottier Plaza. In conjunction with the University Public Affairs mission, Can We Build It is a way to show off your organization’s talent and support local charities. Organizations will build structures out of cans and other various items Canned and boxed food, as well as other various items, will be donated to Ozarks Food Harvest and Sammy’s Window. From 7:30 PM – 9:00 PM on October 10, 2016 at the Hammons Hall for the Performing Arts. The University Community Band will present a fall concert in the evening of Oct. 10. It is free and open to the public. From 6:00 PM on October 11, 2016 at 6:00 PM at the PSU Paw Prints Room. Annie England Noblin ’05 MA ’07 will sign copies of her second novel, Just fine with Caroline, at Paw Prints in the Plaster Student Union. A former Bookstore employee, Annie has authored two novels published by HarperCollins Publishers. From 7:00 PM – 10:00 PM on October 11, 2016 at the, John Q. Hammons Student Center. Participants from student organizations will perform a song in front of a judging panel. You won’t want to miss this exciting and entertaining event! Maroon & White Night will allow all Missouri State students to take a break from the friendly competition. Student Organizations can participate in the Chili Cook Off! There will also be food vendors, various performances on the North Mall and much more exciting events to add to the Homecoming traditions. Frome 6:00 PM – 8:30 PM, on October 13, 2016 at the John Q. Hammons Student Center. The purpose of Yell like Hell Competition is to showcase the organizations pride for Missouri State University and The Bears. Participating student organizations will perform a chand and/or cheer showing pride for Missouri State University. From 7:30 PM – 10:00 PM on October 13 – October 17, 2016 in the Craig Hall Room Coger Theatre. Soak up maroon and white spirit in downtown Springfield during Homecoming weekend! Put on your BearWear to enjoy discounts and specials at participating businesses (FREE). Join fellow Missouri State University Bears in celebrating all things maroon and white during Homecoming weekend: Oct. 14-15, 2016. Events include Bears on the Squre, Breakfast with Boomer, Homecoming Parade, BearFest Village and the football game. fROM 8:00 PM – 10:00 PM, on October 14, 2016 at Hammons Hall for the Performing Arts. The Pointer Sisters began their formal vocal training in their father’s church in West Oakland, California. They went on to achieve worldwide fame as one of pop music’s most dynamic female groups! Starting with their debut album in 1973, they have produced hits on pop, R&B, rock, and even country charts –hits that include “Yes We Can, Can”, “Fairytale”, “Fire”, “Slow Hand”, “Neutron Dance”, “Jump (For My Love)” and “I’m So Excited”. The sisters have played venues ranging from the legendary Troubadour club in Los Angeles to the Grand Ole Opry, the San Francisco Opera House, the White House, and in the closing ceremony of the Atlanta Olympics. They have appeared in films, in heavy rotation on MTV, in a world-wide tour of the musical Ain’t Misbehavin’, and with some of the greatest symphony orchestras in the world. They have been honored with multiple Grammy® Awards, induction into the Soul Train Hall of Fame, and a star on the Hollywood Walk of Fame. Tickets: Orchestra Pit, $50… All other seating $40… plus handling fees. The Missouri State University Homecoming Parade is the highlight of Homecoming for many students, faculty, staff, alumni, and community members. John Q. Hammons Parkway will be lined with people Saturday morning while many entries participate in the parade. Come on out and show spirit and pride for Missouri State University! 7:00 PM – 9:00 PM, October 03, 2016 in the PSU TheaterJoin Student Activities Council as we celebrate our 9th 1st Annual Comedy Competition! This is a long standing tradition where student comedians can come and compete for prizes! Come enjoy the free and local comedy. Contact SAC for information about auditions if you’d like to perform. From 9:00 AM – 5:00 PM, on October 03, 2016 – October 07, 2016 in the PSU NE Lounge. This will be a week long day event where students can write down their stresses or fears and shred them. This event will serve as a major stress release for students in the middle of the semester. The paper will be recycled. We will be offering different stress management resources as well. Come join SAC celebrate homecoming by jamming at Headphone Disco! All day, October 01, 2016 – October 02, 2016Location: TBD (visit the link for updates on the location). Friends Against Hunger is a nonprofit organization focused on feeding the hungry in the United States and worldwide. Missouri State University had students, faculty, and staff fill over 4,000 volunteer spots to help package meals! During this weekend, Missouri State University and the community will come together to package these meals. Volunteer opportunities start every half hour. This will take place in the Springfield Expo Center. Students, faculty, and staff, families, friends, ANYONE can register to participate. This annual campus-wide event is an opportunity to raise money and awareness to find a cure for breast cancer. Proceeds go to the American Cancer Society. From 4:00 PM – 5:00 PM, on October 06, 2016 in Craig Hall Room 334. October 11th, 2016 in Craig Hall from 11:00 AM – 3:00 PM. Resume Madness is held each semester at various locations around campus. Students and alumni are invited to bring a hard copy of their resume to receive a quick review and some tips to promote qualifications, education, work, internship, practicum and volunteer experience on the resume. All day, October 10, 2016 – November 04, 2016 on Missouri State Campus.In the spirit of our Public Affairs mission, the Missouri State Way Campaign and the United Way Campaign are a combined effort on the Missouri State campus. Our goals remain the same, participation and support for our campus through the Missouri State Way and for our community through the United Way. These are two great ways for Missouri State faculty and staff to make a difference!Please make your gifts and pledges by Oct. 28.Join us for the Celebration Luncheon on Nov. 4 from noon to 1:00 p.m. in the Plaster Student Union Ballroom. Please RSVP to the luncheon by emailing monicasharpe@missourstate.edu. 12:00 PM – 1:00 PM, October 12, 2016 Plaster Student Union, Robert W. Room 317. Presented by Dr. Char Berquist and Ms. Heather Blades This session will explore how to give and receive feedback in the best ways possible, and will offer tips on how to handle these tough conversations and turn an otherwise uncomfortable experience into an opportunity for growth. 6:00 PM – 9:00 PM, October 15, 2016 in the Plaster Student Union, TheaterJoin us for a viewing of the documentary, FLESH: Bought and Sold in the U.S., to learn about human trafficking in the United States. This documentary is a story told by those who are enslaved and those who have escaped, by former and current pimps, and by the abolitionists of today. It reveals the heartbreaking truth of one of the largest criminal industries. Following the documentary, there will be an open panel discussion with the ability for viewers to ask questions. This documentary showing is hosted by Stand Against Trafficking, the Criminal Justice Society and the Department of Criminology and Criminal Justice. 7:00 PM – 9:00 PM, October 07, 2016 at Hammons Student Center, John Q. 10:00 AM – 1:00 PM, October 08, 2016 at Hammons Student Center, John Q. 2:00 PM – 5:00 PM, October 08, 2016 at Plaster Stadium, Robert W.
7:00 PM – 9:00 PM, October 08, 2016 at Hammons Student Center, John Q. 7:00 PM – 9:00 PM, October 10, 2016 at Hammons Student Center, John Q. 2:00 PM – 5:00 PM, October 15, 2016 at Plaster Stadium, Robert W.
at Hammons Student Center, John Q. Free to all MSU faculty, staff and students. Tau Kappa Epsilon presents their annual bubble soccer tournament benefiting St. Jude’s Children’s Cancer Research & American Red Cross. Cash prize or give to a charity of the winners choice. Registration ends September 28th at midnight. Sign up your team on imleagues.com. The tournament will be on Saturday, October 1st from 3:00-7:00pm and costs $60 per team.